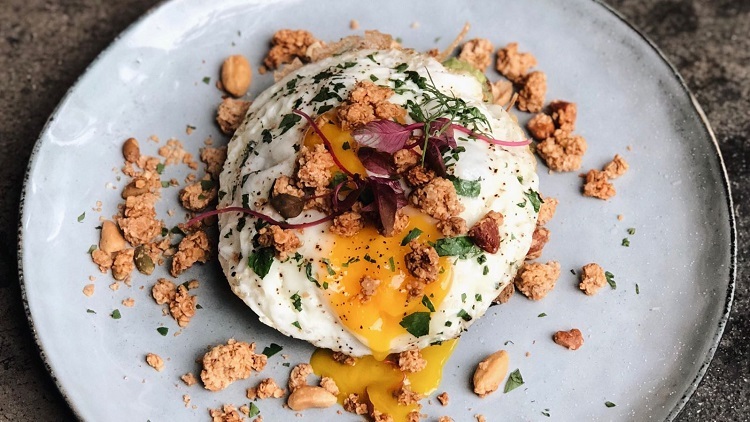 It's no secret that Shanghai is home to some extraordinary restaurants doing world-class fine-dining, excellent snacks and street eats and vegetarian food that'll make you question whether you ever need meat (not to mention the brunches...). Whatever your budget or palate, we've got you. Here's where to take a stab at Shanghai's best dishes. RECOMMENDED: Full guide to the best restaurants in Shanghai. 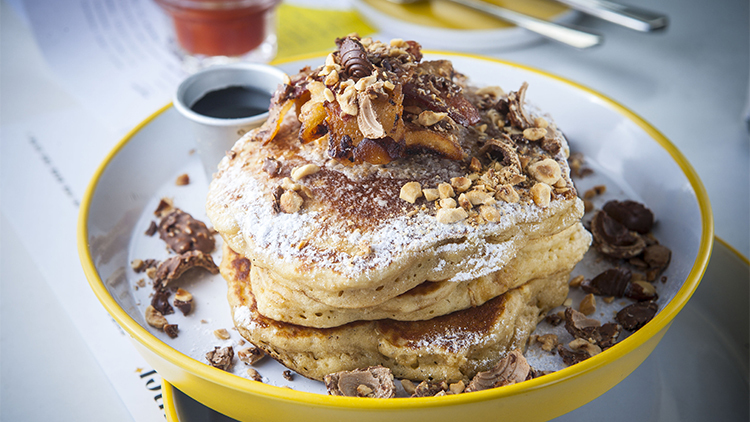 Not your average diner stack, this over-the-top treat from Austin Hu’s gentrified diner sees fluffy pancakes decked out with hazelnut butter, Ferrero Rocher, bacon and fried banana. 78RMB. Sitting atop a slice of wheaten sourdough spread with a thick layer of herby ricotta, a mound of buttery mushrooms are liberally doused in truffle oil and topped with a perfectly poached egg and sprinkling of fresh thyme. 58RMB. 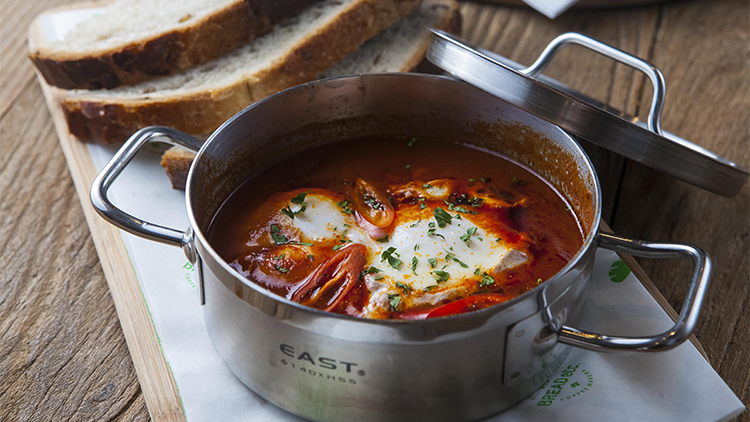 Two runny eggs are engulfed in a rich tomato sauce – that’s spiked generously with chilli – and ready to be mopped up by a wedge of pillowy challah bread in Bread etc’s brilliant rendition of the Middle Eastern poached egg dish. 62RMB. A hangover cure for the ages, a chewy bagel is stuffed with bacon, fried egg and gooey cheddar cheese. Add avocado (10RMB) and a glug of the BYFO Green Machine hot sauce for good measure. 45RMB. 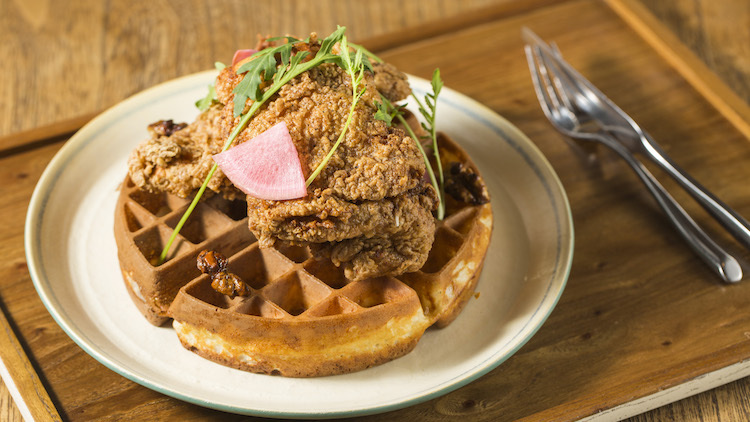 A perfectly crispy and fluffy waffle stacked high with tender and savoury fried chicken, well-spiced and complemented with the sweet strokes of candied walnuts and jujube honey. 78RMB. With delightfully flaky pastry, this wonder-trio of BBQ pork, black pepper venison and abalone and matsutake puffs is pure bliss. 298RMB (as part of four-course brunch set). 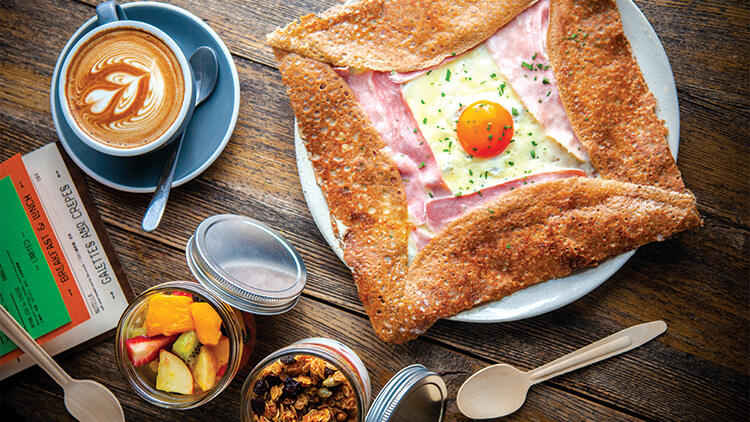 RAC’s Breton-style galettes are brunch perfection on a plate (rivalled perhaps by its breakfast sandwiches, but that’s another story). Parisian ham, cheese and a brilliantly orange egg front and centre. 45RMB. Much more than just an almond croissant, this hulking pastry is closer to a pie than anything, filled generously with frangipane and showered with sliced nuts. 20RMB. Before you judge, just wait a second – this isn't any ordinary #basic avocado toast (not that there'd be any shame if it was). As with everything at Daliah, there’s a delightful twist from the norm. Set on a thick slice of dark German bread, avocado mash seasoned with garlic, lemon and a touch of chilli support two sunny-side-up eggs and crumbles of goats cheese. House-made granola is strewn about enthusiastically before the whole thing is garnished with microgreens. 69RMB. 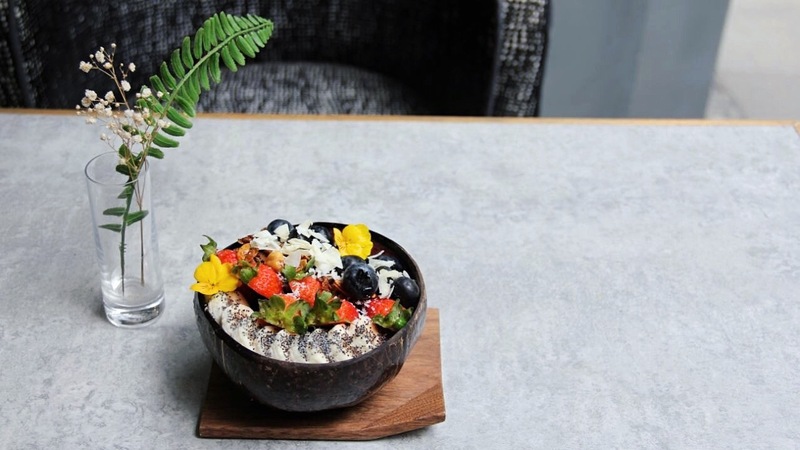 This smoothie bowl gets an all-natural sweetness from a base of frozen açaí berries (imported from Brazil) and frozen bananas, plus heaped toppings of strawberries, blueberries, banana, coconut flakes, chia seeds, edible flowers and house-made granola. 32RMB (small); 45RMB (regular). Part of a quartet of famous breakfast foods known as the 'four big warriors' (四大金刚, sidajingang), this rice roll is shaped using a makisu bamboo mat. The main components are steamed rice and youtiao, with both sweet and savoury versions available – the savoury with pork floss and salted egg yolk, the sweet with a sprinkling of sugar. 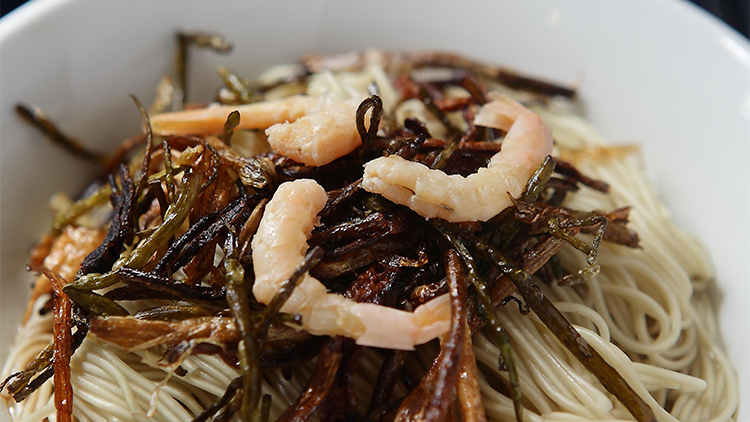 A Shanghai classic done right, wheat noodles are oil-tossed with tangles of caramelised scallions and crowned with delicate shrimp. 18RMB. Tender noodles, fragrant greens, creamy peas, braised beef and just enough heat and numbing flavour. 12RMB. You'll queue for anything up to two hours to get your hands on one of Ada's congyoubing, but it's worth it. Cash only. 7RMB. 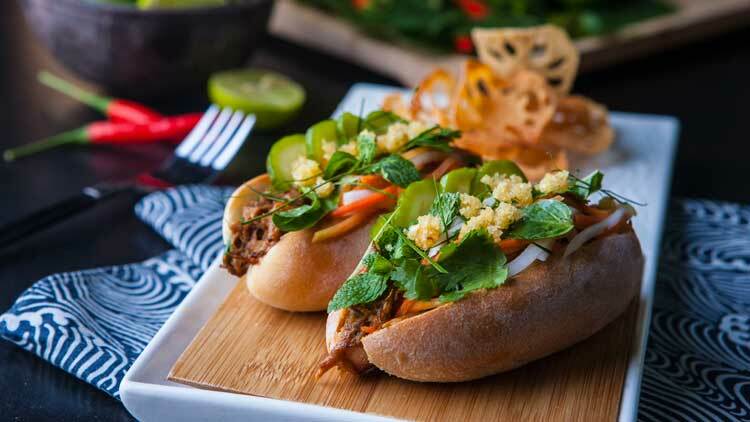 A brilliant take on the Vietnamese classic with tangy carnitas spiked with a sweet tamarind aioli. 78RMB. Philly cheesesteak meets a French Dip: amazing. 98RMB. This old Beijing-style jianbing is chewy and crunchy in all the right ways. The wheat flour pancake is topped with an egg, fermented soy sauce, a brush of chilli and a sprinkling of sliced scallion and sesame seeds, before it's wrapped with a crisp baocui at its centre. 7RMB. Meat mooncakes are unlike their sweet counterpart in every way. 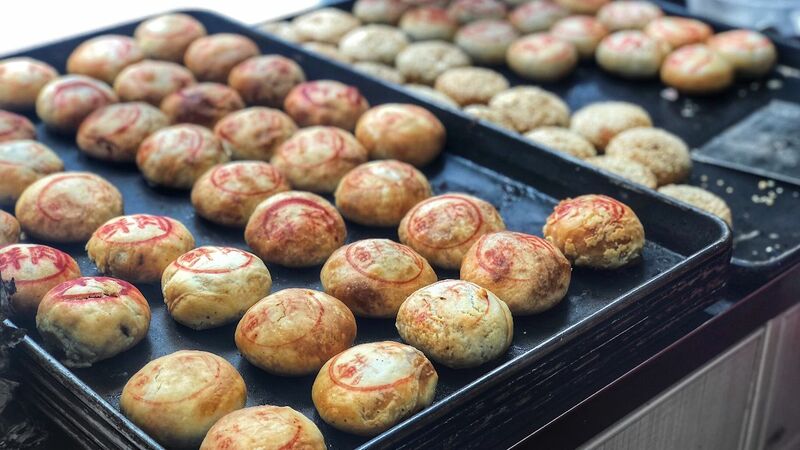 Somewhere in-between a baozi and xieke huang, the juices from the meaty filling of this Shanghai snack seep into the flaky pastry as it bakes until golden. 4RMB. There's always a line, and they stop selling these at 10am. Go early to get these seriously hearty xiaohuntun. 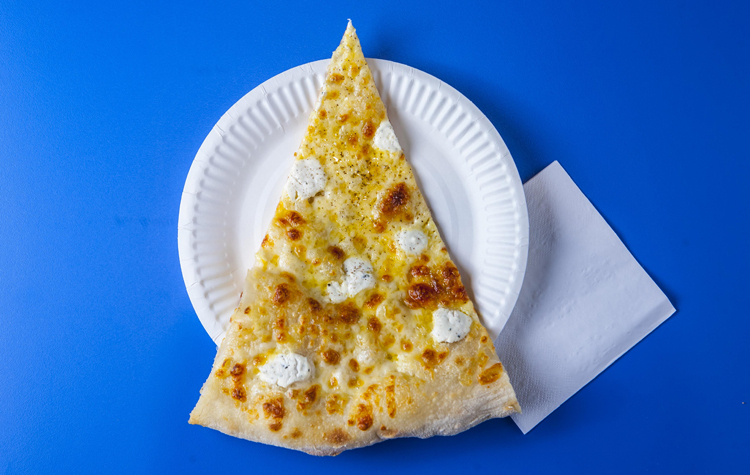 A firm-but-chewy crust and a base slathered with parmesan cream and coated in mozzarella and dollops of ricotta. ’Nuff said. 25RMB (per slice); 195RMB (20-inch pizza). A bowl of noodles drenched in thick sesame paste with a slick of chilli oil for a bargain price. 10RMB. 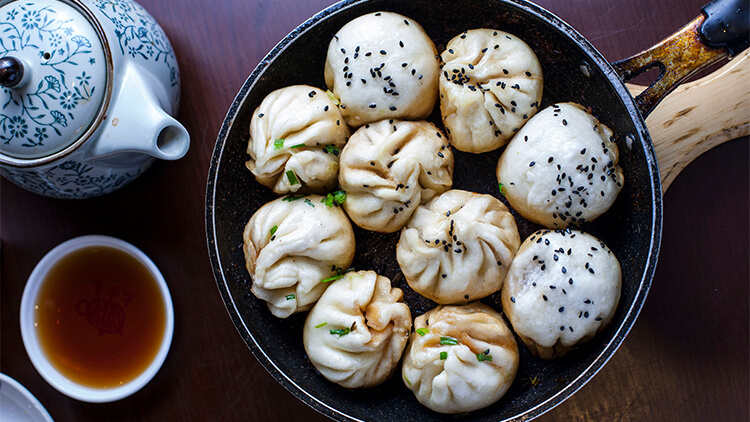 A perennially popular and super cheap breakfast snack (though great eaten at any time of the day), these steamed buns are stuffed generously with fillings from pork and preserved veg to bok choy, tofu and mushroom to black sesame. Babi Mantou also has hundreds of stores all over the city. From 1.5RMB. This unassuming bar bite is packed with a decadent punch from truffle and tangy cheese that belies its humble appearance. 52RMB. Meaty wontons without too much skin but plenty of delicious, hot and numbing Sichuan flavour. 22RMB. Passing the litmus test of a good fry with flying colours, these crispy-on-the-outside, fluffy-on-the-inside chips were good enough on their own, and then they made it even better with truffle. 48RMB. The traditional Shanghai style of fried soup dumpling – pillowy soft up top and perfectly crisp on the bottom. 8RMB for four. The huangyu mian from this Ningbo hole-in-the-wall are well deserving of their fame. White flakes of croaker fish float atop a rich, salty broth bathing a bed of noodles. 26RMB. 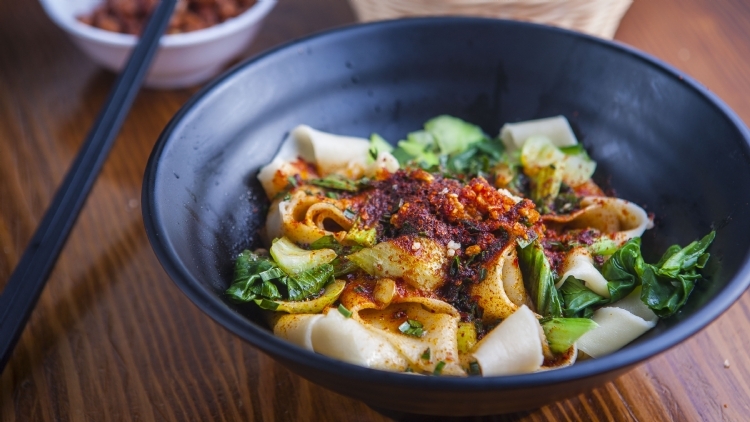 This famous Shanghainese noodle joint pulls in huge crowds through its lunchtime sittings for its freshly pulled noodles tossed with xiancai. 12RMB. The delicate dumpling skin of Jia Jia's xiaolongbao encases a steamy fragrant crab soup. 99RMB for 12. 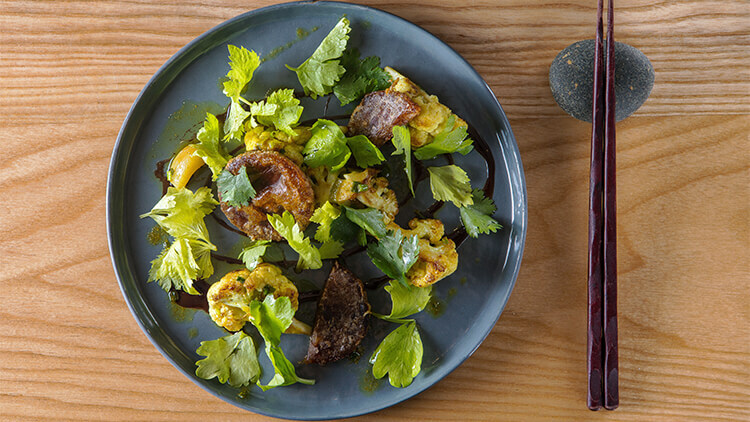 The wizards in the kitchen at RAW – and by wizards we mean heartthrob Juan Campos and team – take simple ingredients and turn them into something magical. For the tartare, finely sliced Chilean wagyu is served on a bed of crushed ice with smoked egg yolk and a shallot and onion garnish. Accompanied by bread crisps and a side of fries, it’s more than enough to share between two or more as an appetiser. 128RMB. A side of lemon, shallot vinaigrette and ginger ponzu sauce bring these famed oysters out of their shell. 198RMB per dozen. 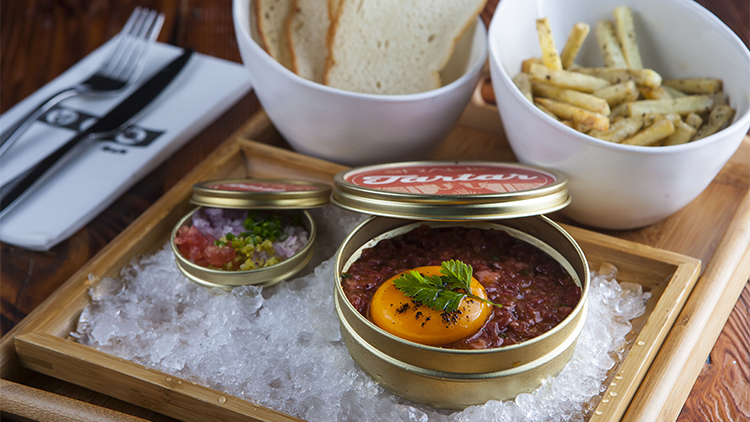 Jean-Georges takes the humble oeuf to a whole new level (and price point) with its signature Egg Caviar. 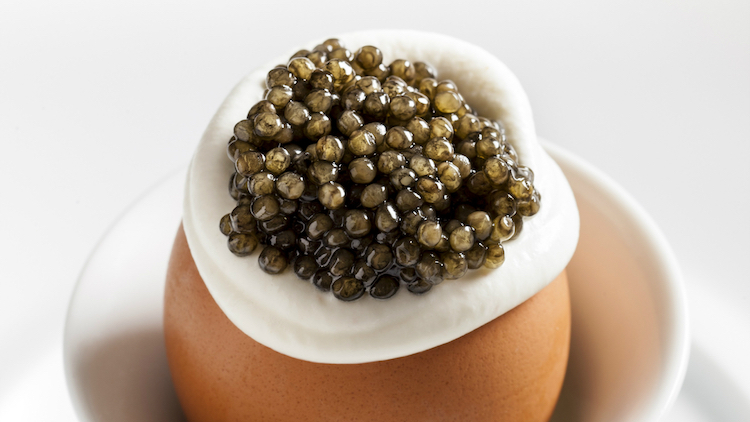 Presented in a shell, silky scrambled egg is topped with vodka-whipped cream and capped with a healthy spoonful of caviar. 388RMB; 88RMB (happy hour). Firm but tender octopus tentacles come coated in gochujang – sweet, spicy and tasting a bit like rice cracker snacks from 7-Eleven, in a very, very good way. 118RMB. This is an explosive bite you'll want to savour. 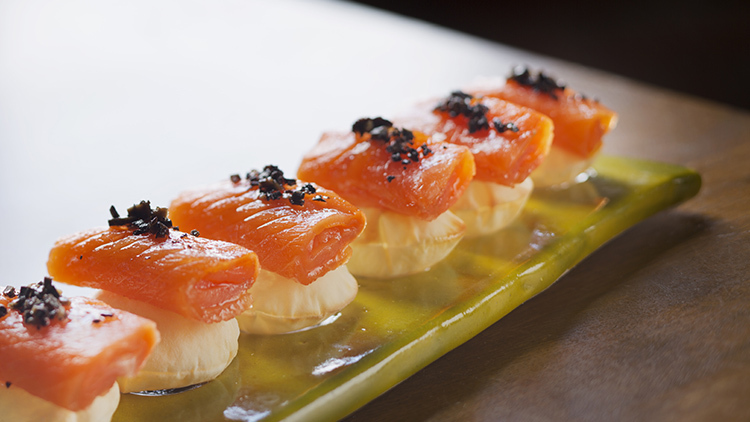 A crisp bread pocket is filled with sour cream and topped with Balik salmon and truffle honey. 108RMB. The simple button mushroom never tasted so good. 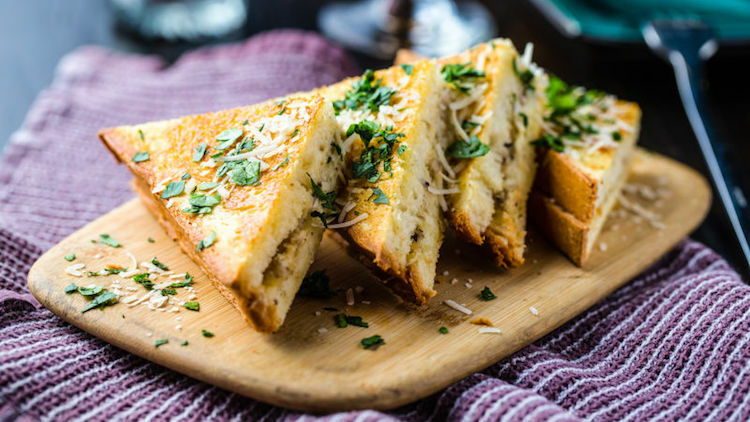 Served in a rich, béchamel sauce, earthy sautéed mushrooms are piled generously around a perfect runny egg yolk with shavings of parmesan and thick slices of toasted baguette for dipping. 88RMB. A classic done right, thick cuts of fried potato are loaded up with a lightly spiced tomato sauce and creamy mayo. 45RMB. 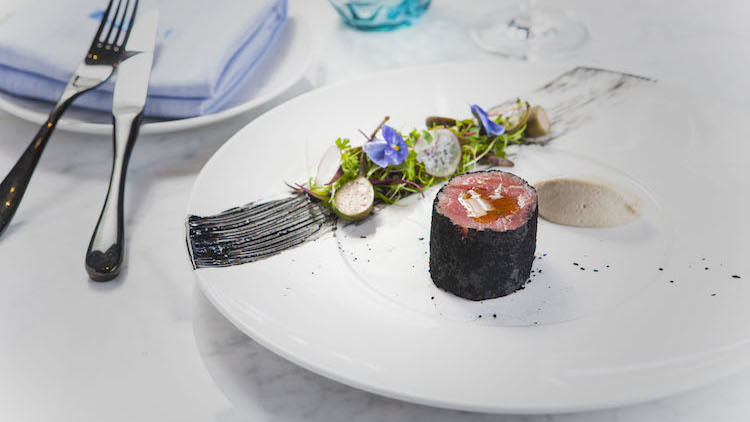 An off-menu dish, the visually arresting vitello tonnato (a traditional Italian surf and turf pairing of veal and tuna) offers a charcoal-black-edged round of melt-in-your-mouth, milk-fed veal with a quenelle of tuna mousse, flanked by a bold stripe of squid ink. 118RMB. This is chef Alvin Leung's (also of Daimon Bistro) signature dish. Imagine a classic soup dumpling with the flavour turned up to 11 and all in one lightning-quick explosion. Part of 1,680RMB set menu. 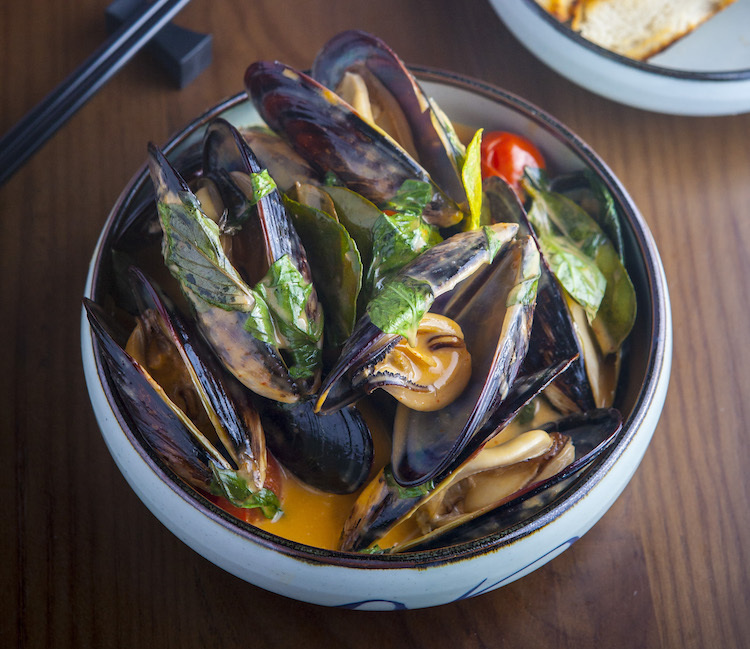 Plump mussels bathe in a creamy Thai-style coconut and chilli broth with a garnish of basil. 148RMB. 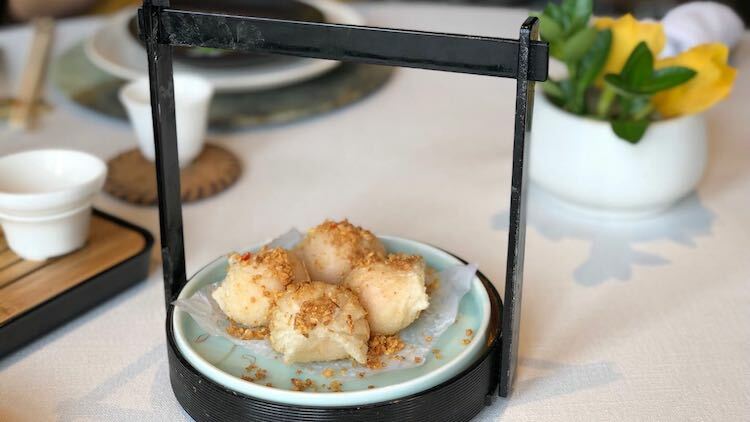 Demon chef Alvin Leung has pulled some Dr Frankenstein-style moves, mashing up a pineapple bun with a classic barbecued pork bun. The result? Some kind of ultra-buttery, insane indulgence. 32RMB (two pieces). This almost seems like a scam, it’s so delicious for something so simple. Grassy Spanish manchego thrown in the Josper charcoal oven until crispy on the outside and oozy on the inside, drizzled with honey and sprinkled with toasted almonds.158RMB. 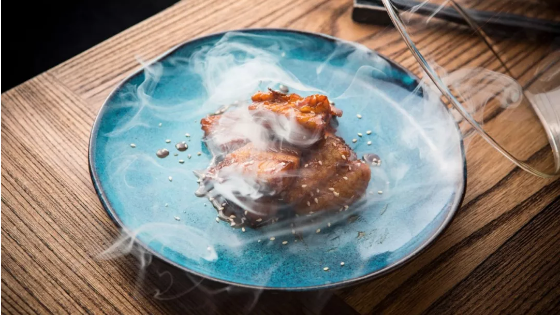 Firmly in the ‘sounds weird, tastes amazing’ category of food, a cloud of puffed rice crackers billows off the plate, hovering about a rich whipped duck liver, crispy pig ears and an ingot of smoked eel in a pool of soy mint caramel. The kind of dish you could eat with a spoon and the same amount of pleasure as cookie dough ice cream and a Rom-Com. 52RMB. Good things come in threes, and that’s certainly true for this platter of house-made pâtés. 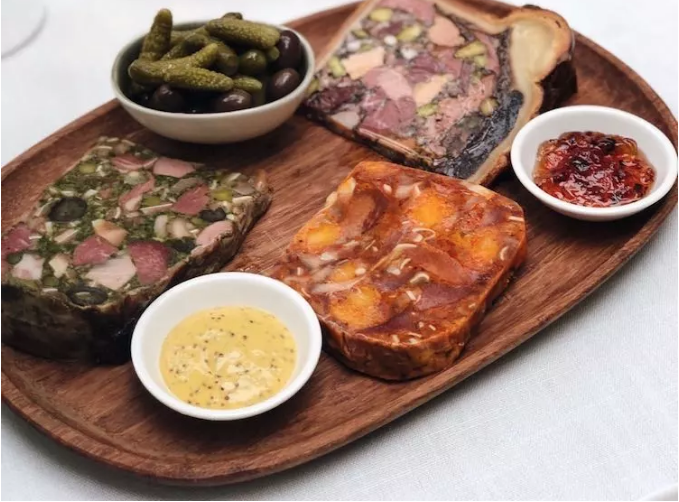 Decadent but not too OTT, the cutting board bears a veritable feast of Lyon-style pâté en croute, a piquant headcheese pâté and a black truffle pâté. 388RMB. It doesn’t get much better than a meatball with a curry centre... except if you make a sandwich out of it. And there’s bacon. 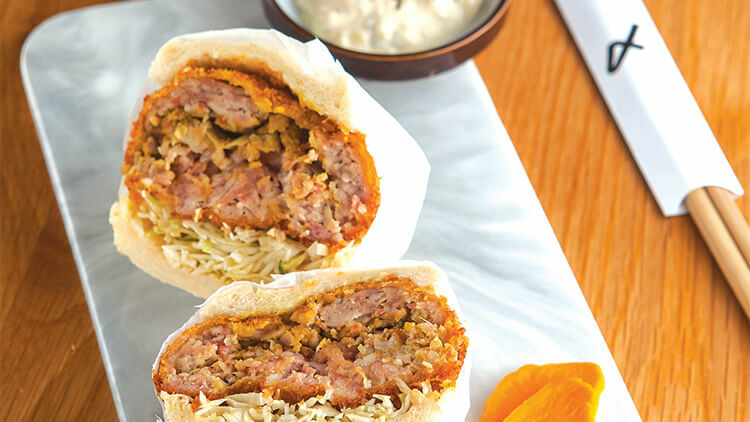 A blend of possibly the world’s most delicious meat, minced pork belly and caramelised onions, the patty is stuffed with curry, breaded and deep-fried. 50RMB (lunch set). A kickin' combo of beef shin, jalapeno, chives, parsley, vinegar, Tabasco, cheddar, spicy tomato, butter and cream cheese are wedged between two halves of chewy bagel. 60RMB. A Hong Kong ramen chain with some serious credentials, Butao's signature bowl sees a thick and luscious base of creamy tonkotsu (pork bone) soup served with a large sheet of seaweed and an egg on the side. 68RMB. 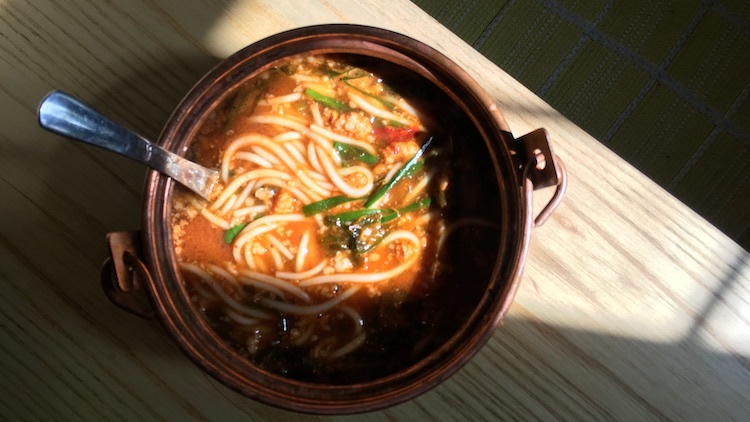 Served piping hot in a small copper pot, Yunnan rice noodles (mixian) bathe in an addicting hot-and-sour soup made from Yunnan herbs and pickled mustard greens, tender rice noodles, minced meat and green veggies. 38RMB. The Ferrari of poke bowls, this slick dish packs a whole lotta punch: salmon, Hokkaido scallops, salmon roe, tobiko roe, cashews, avocado, scallions, seaweed salad and pickled cucumbers are piled high on a mound of sushi rice and liberally coated in the fishmonger's signature Dynamite sauce. 118RMB. Served in a portion fit for two, chewy and fresh-from-the-boil hand-pulled belt noodles are tossed in oil and topped with a blend of chillies, spring onion, garlic, bean sprouts and bok choy. Add a splash of vinegar and soy sauce, stir well and tuck in. 20RMB. The Molten Oppa Love is a grilled cheese and then some. Oozing gruyere, cheddar and mozzarella are sandwiched between two buttery slices of wholewheat sourdough, topped off with smoked cola ham and kimchi for an extra kick. 55RMB. Take your pick of base (grains, greens or noodles) and protein (chicken, salmon, tofu and more), slather it in a creamy sriracha sauce and load it up with avocado, pickled cucumbers, edamame and wakame seaweed. 65RMB. 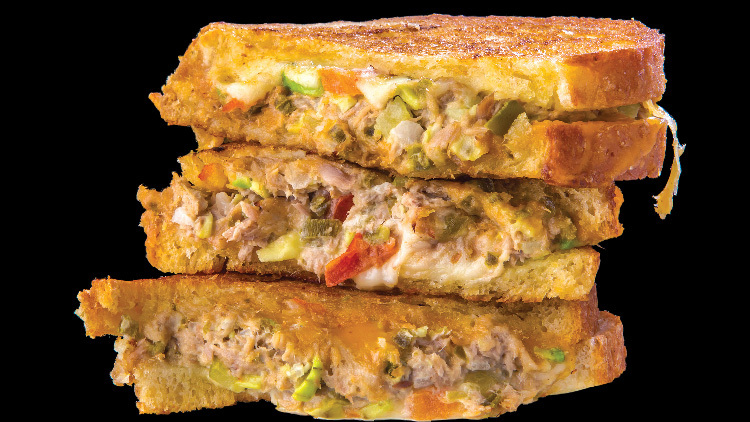 Crisp and golden brown sourdough, a fresh and punchy tuna salad and a thick coating of gooey swiss and cheddar cheese make this tuna melt pop. 49.99RMB (regular); 64.99RMB (large). Simple and unfussy, The Habit’s Double Char is a straight-up, classic fast food cheeseburger – meat, cheese, lettuce and tomatoes. The difference here? Patties are freshly made with beef ground in-house. Juicy and flavourful, it’s so much more than your average Macca’s or Burger King. The self-serve pickle bar doesn’t hurt either. 38RMB. A classic done right: a toasted challah bun is crammed with house-brined and smoked beef brisket, tangy sauerkraut, silky melted cheddar and a 'secret' Reuben sauce. 78RMB. With the insides of 12 crabs (six female, six male), salt and a sprinkling of gold flakes, Cejerdary’s Xie Huangjin – literally ‘Crab Gold’ – is the stuff of simple and straightforward extravagance. Expect a queue. 1266 Kaixuan Lu, near Anshun Lu. Hongqiao Lu. 360RMB. Salt, coconut water and chicken – that's the hotpot base. After you’re done cooking with it, don’t ditch the pot like you would at any other hotpot place. 138RMB; 198RMB (whole chicken). 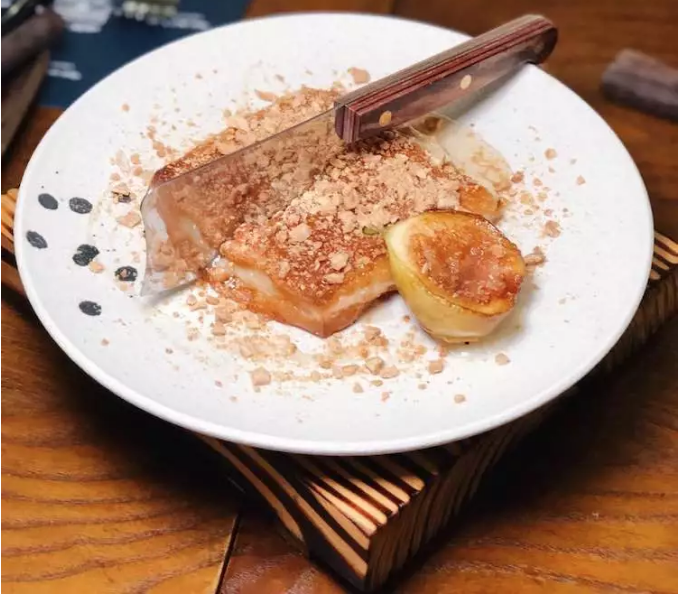 Perhaps Ningbo’s best-kept secret, the fried bamboo slivers in this dish are basically crack, mixed up with cured ham, shrimp, gingko nuts and a shower of sugar. 78RMB. Velvety halibut gets a kick from a drizzle of spicy parsley and garlic oil and a smoky finish from a turn in the Josper oven. A whole fish, this dish is great for sharing. 198RMB. Is it wrong to call this the savoury and elevated adult version of a Snack Pack vanilla pudding? 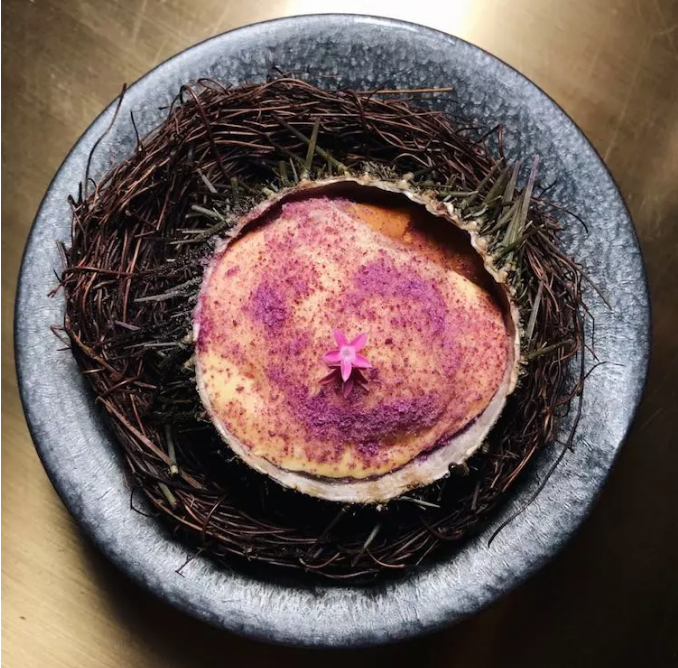 Presented dramatically in a spiny sea urchin shell, ultra creamy egg custard is studded with briny uni and tender strands of snow crab, accented lightly with a tart lime cream. 118RMB. Hidden under a mound of crisp, charred scallions and liberally doused in oil, the fish head at Jesse’s is a signature worth returning for – again and again. 228RMB (pre-order only). You’d never think that fish could taste like candy, but you’d better believe it. Arriving in a smoke-filled belljar, small crispy fillets of pomfret perfumed with jasmine tea have an addictive sweet start and savoury finish that you’ll be popping like Skittles. Wedges of flatbread are stir-fried with fatty chunks of mutton, onions, and a heavy coating of Xinjiang spice mix. 68RMB. 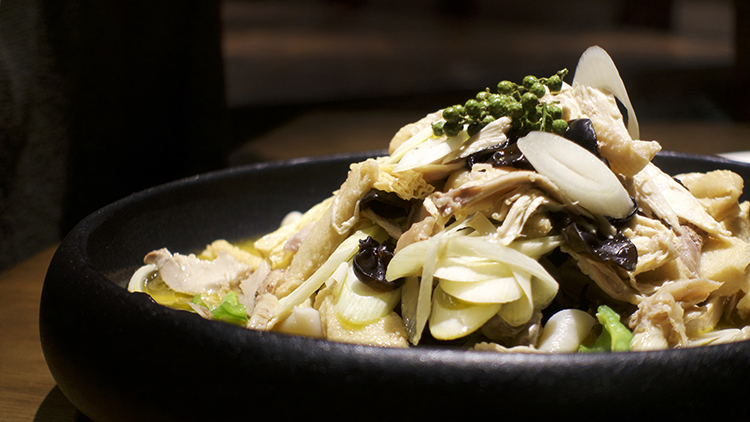 A mountain of tender chicken, tofu, wood ear mushrooms and green onion sits in a thick pool of chicken stock mixed with numbing pepper oil. If you’re a numbing pepper addict, this dish is going to be the one that does you in. 69RMB. Taking campfire food to a whole new level, an orange-pink slab of salmon is slow-smoked over a fire pit. The result is a piece of fish that’s all sorts of succulent, smoky and just all kinds of swoonworthy. 398RMB (quarter); 788RMB (half); 1,388RMB (full). 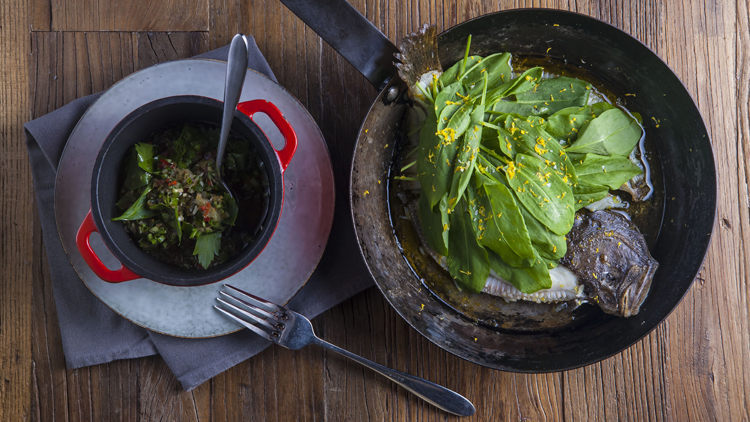 ‘Whole turbot filled with brown butter sauce’ sounds so innocent, but it’s a devil of a dish. Liberally doused in a lemony browned butter sauce, this flaky fish will linger in your mind for days. 238RMB. A dish also known as 'squirrel fish' – allegedly for its 'squirrel'-like appearance – the white fish is deboned and cut in a crosshatch pattern before being battered and deep-fried (which is when it gets that bushy 'tail' look). It's then liberally covered in an auspicious-red sticky sweet and sour sauce. 328RMB. 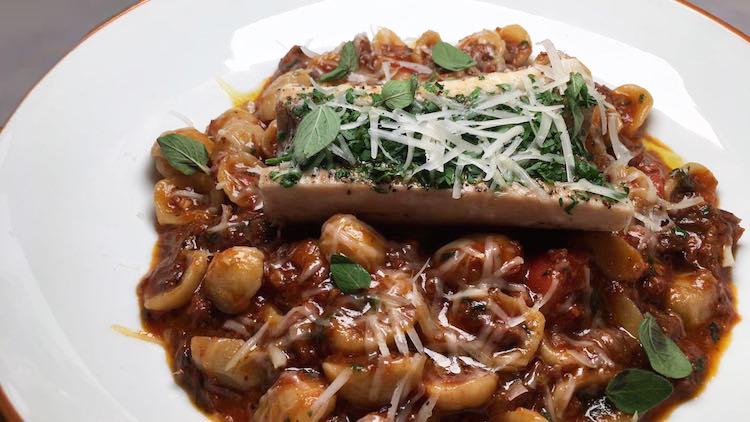 There's a reason this is Mercato's moat popular dish. A three-cheese mix (mozzarella, fontina and Parmesan) is sprinkled on top a layer of Italian truffle paste before an egg is cracked into the centre. 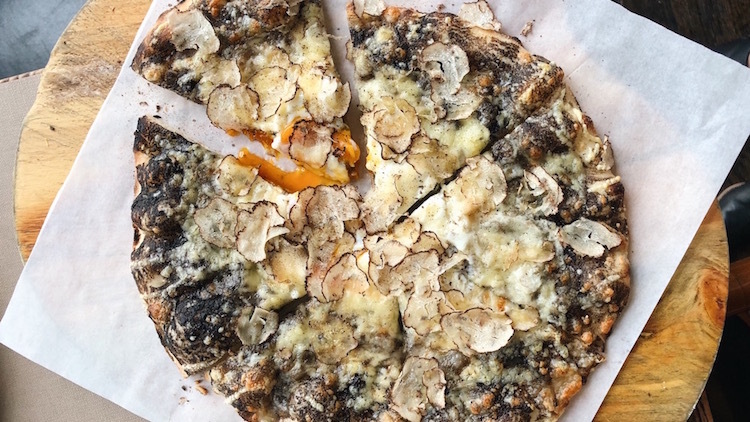 After it's pulled out of the oven, the whole thing is showered in shavings of fresh black truffle, producing a fragrance so redolent that should be bottled and sold as Mercato's signature scent. 218RMB. 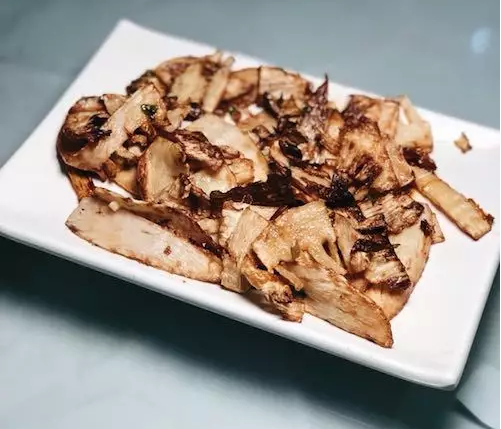 The double technique approach (braised then fried) in this Shandong speciality means the chicken avoids the dreaded white meat dryness – super succulent with supremely crispy skin. Pulled apart by hand and topped with shredded carrot, spring onion, chilli and coriander. 40RMB. 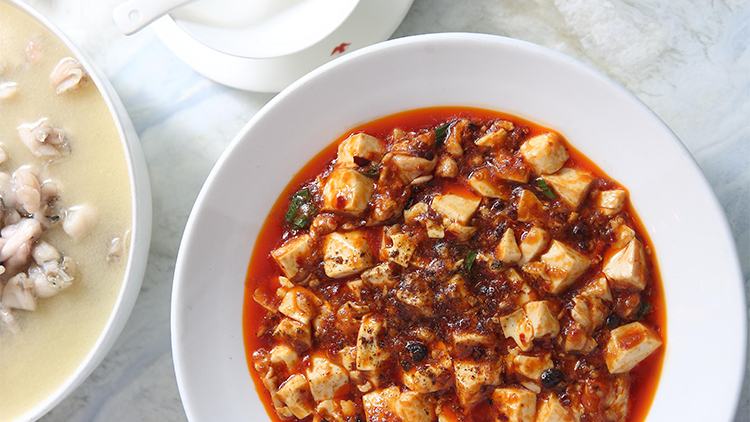 Silky tofu arrives coated in a vibrant red sauce studded with mouth-numbing Sichuan peppercorns and pig brain. 53RMB. Pie Society’s steak and ale pie takes tender pieces of steak, carrot and mushroom, braises it all in a hearty beef stock with Guinness and then wraps it all in a hot and flakey pie crust. 55RMB. 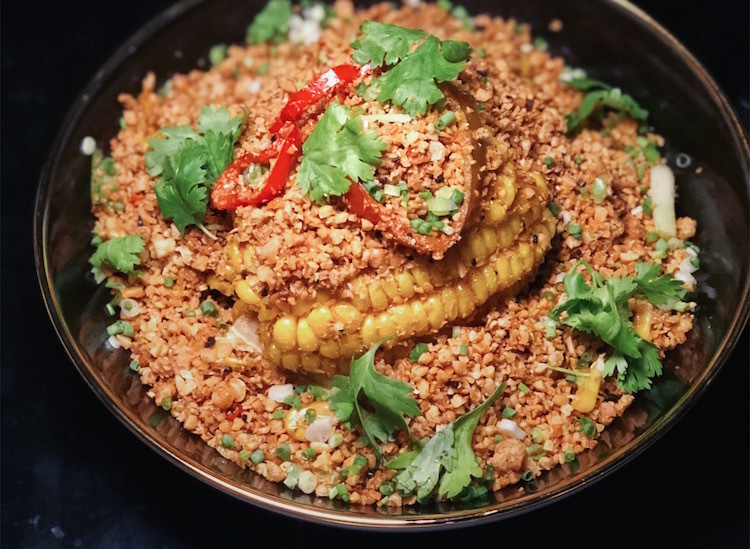 A riff on a Hong Kong icon (typhoon shelter crab), this lucky dip of a dish hides chunks of fried corn beneath a thick blanket of crisp garlic crumbs with scallion, black beans, chillies and coriander. 88RMB. For Peking duck to rival the capital, Xindalu has got your number. Cooked in the upscale restaurant's wood-fired oven, the duck is crispy and juicy in all the right places. 238RMB (half). 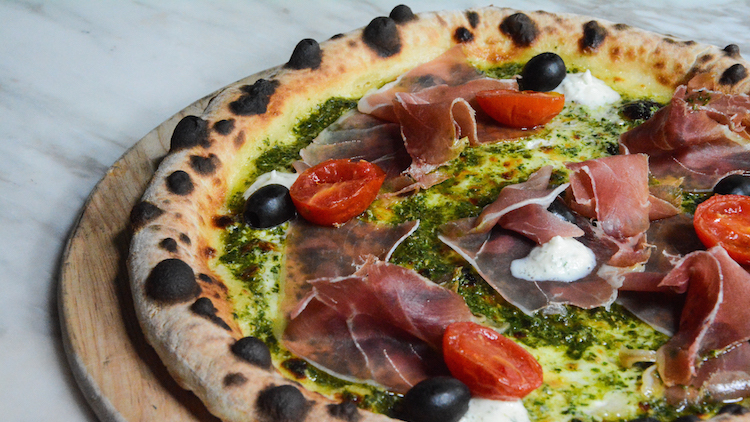 This brilliantly simple pizza takes one of Gemma's signature Neapolitan-style bases (characterised by their cloud-like crust), covers it in a blanket of crème fraîche, and tops it off with delicate slices of prosciutto, lashings of herb mascarpone and homemade basil pesto. 120RMB. We’re positive you’ll never have pasta with butter and cheese this good anywhere else. Ribbons of handmade tagliolini come slicked in butter and parmesan cheese with redolent shavings of the truffle of the season, be it black or white. 398RMB. Chewy, ear-shaped orecchiette are coated in a rich, long-simmered ragù sauce and served with fabulously unctuous roasted bone marrow. 168RMB. There’s no denying there are a lot of great hongshao rou in this city, but Ren He Guan’s rendition nails it on all levels. Sticky and sweet, it’s served in a single melt-in-your-mouth chunk with two quarters of a hard-boiled soy egg for 19RMB. Just the perfect amount for this ultra-rich, fatty classic. 18RMB. The plant-based burgers at this health-focused vegetarian restaurant (there's even a strict no-frying policy) are signatures. Vibrant, fresh and packed with flavour – served with a lick of vegan mayo, smashed avocado, pickle, tomato and a muddle of organic sprouts – the quinoa and beet burger easily holds its own against its beef counterpart. If beets aren't your jam go for the portobello mushroom and pineapple burger (58RMB). 52RMB. Less is more with this delightfully simple pizza that relies on three key ingredients: DOP buffalo mozzarella, vine-ripened cherry tomatoes and fresh basil. Bellissimo. Insider tip: go for the late-night menu from 10pm Thursday to Saturday when all pizzas are 100RMB. 150RMB. 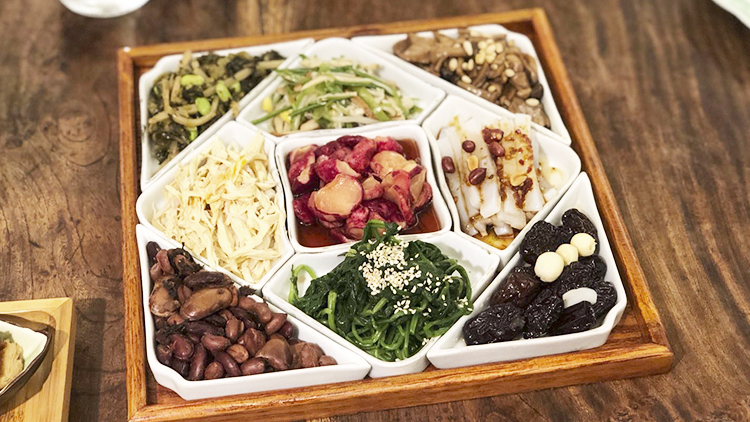 With a presentation as delightful as each of the tiny dishes, this massive vegetarian jewel box offers up a treasure trove of cold starters. From crunchy pickled pink radishes to marinated mushrooms with pine nuts, it’s an appetiser less ordinary. 118RMB. 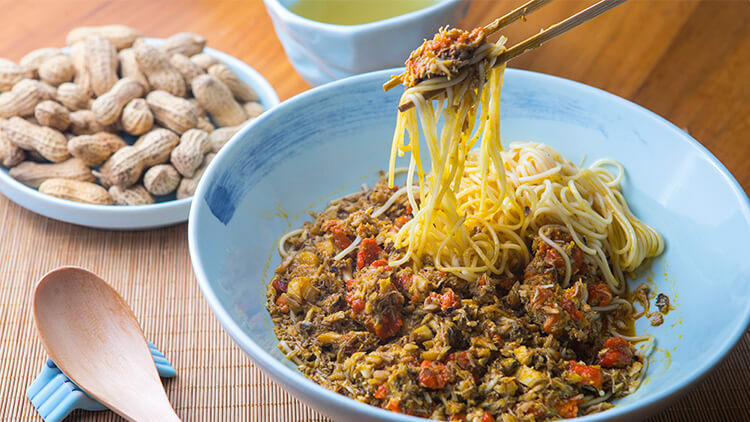 Not the imposing bowl of belt noodles you might expect when you see 'biang biang' on a menu, but just as delightful. 26RMB. Cashew sauce is the creamy secret behind this light macaroni salad side. 18RMB. 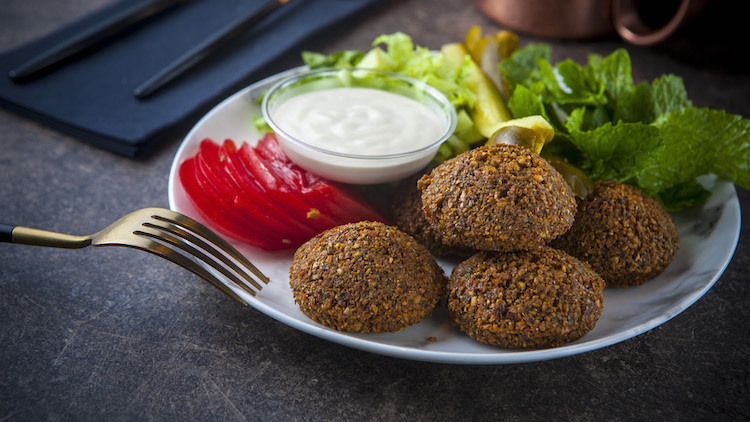 There’s falafel and then there’s falafel. Eli’s is the latter – with a crisp outer layer that conceals a fluffy, herby centre. For this dish, the chickpea patties are wrapped together tightly with tomato, pickle, parsley and a lashing of creamy tahini inside Lebanese flatbread. 40RMB. These sticky morsels are everything a sweet and sour sparerib should be, just minus the meat. 38RMB. A blend of stir-fried potato and okra, this punchy and fragrant side dish is made to be mopped up with roti. 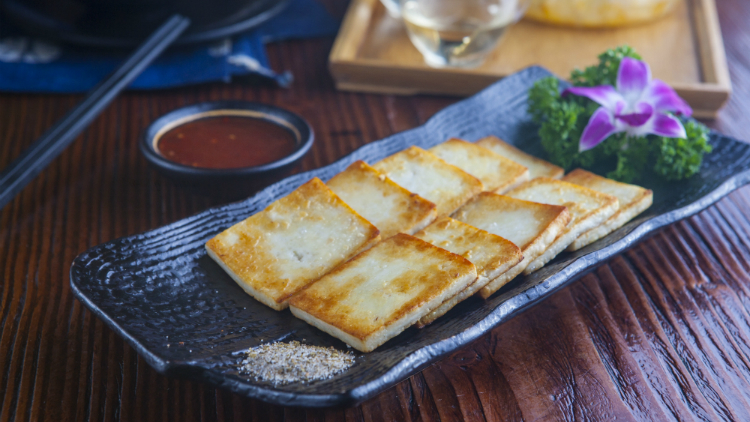 Fried with salt and chilli, you'll be popping more pieces of this undeniably moreish cheese than you thought your stomach could stand. 26RMB. 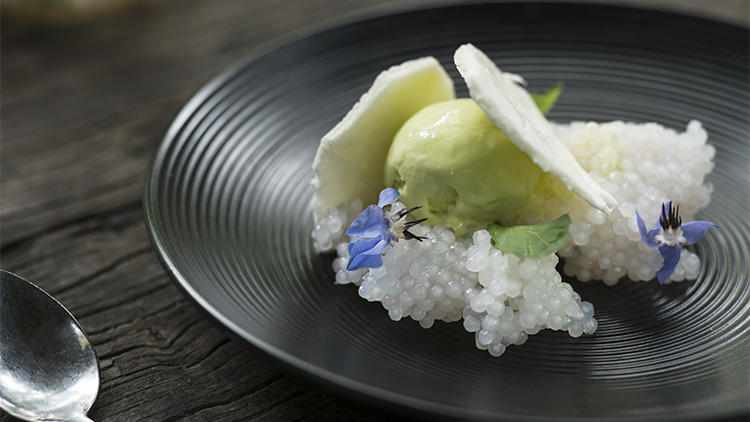 The Southeast Asian island of desserts, chewy coconut sago pairs perfectly with satin-smooth pandan ice cream and a feather- light meringue. 58RMB. Dropped in a steaming hotpot for five to ten minutes, the Taiwanese chain's toothsome whirls of tofu ice cream transform into a creamy soft serve. 10RMB each (one free per person when ordering à la carte). There’s a reason that the Commune Social’s signature dessert hasn’t come off the menu since opening in 2013 – with peanut ice cream, brittle, seasonal berries and a salted peanut caramel crunch, this deconstructed take on a PB&J has a perfect triumvirate of sweet, salty and crunchy. Childhood on a plate. 62RMB. The Highline kitchen doesn’t hold back with this towering, three-layer leviathan of a dessert. 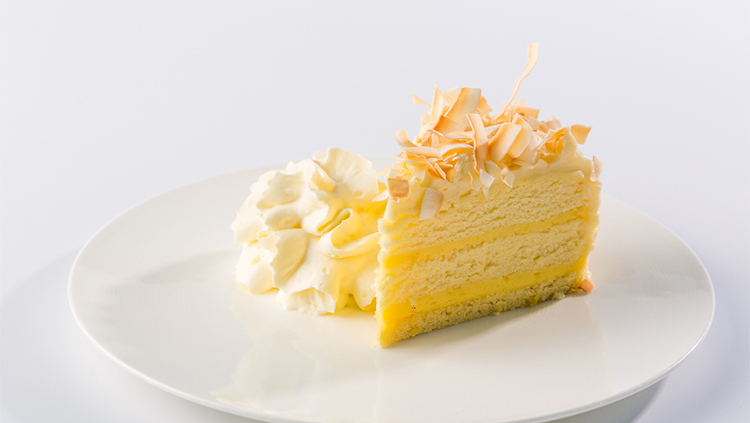 Think sweet-tart lemon curd filling, light and airy chiffon cake and generous waves of coconut frosting, all topped off with toasted coconut shavings. 88RMB. Bringing the best of the snack world together, the Snack Pack is a mix of Oreos, caramel, crisps and pretzels in one seductively gooey cookie. Available online at strictlycookies.com or via the official WeChat store (search 'StrictlyCookies'). 70RMB (five cookies). Lusciously rich and creamy, it's easy to see why owner Eduardo Vargas' signature burnt caramel egg custard has been in play for over a decade. 58RMB. 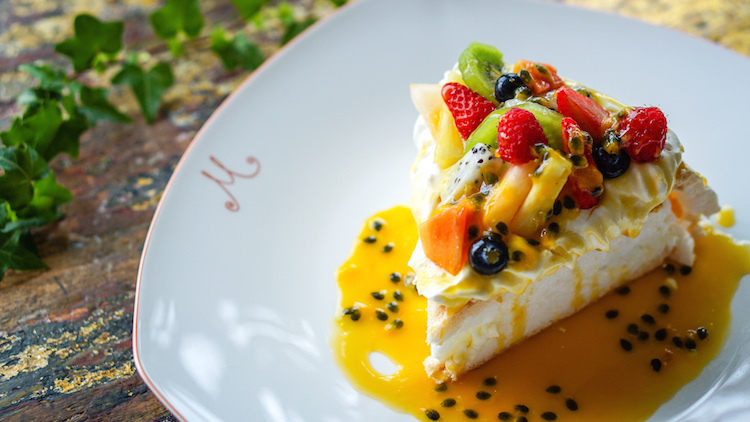 Scaling ambitious heights, M's rendition of the simple-to-make-but-hard-to-master dessert is presented as a gleaming tower of tropical fruits piled atop a fluffy cloud-like interior and a magically crunchy meringue crust. 108RMB. It might look simple from the outside, but don't be fooled – this Paul Pairet creation takes days to make. Whole lemons are meticulously hollowed out over a period of 72-hours before being filled with a tart mélange of lemon chantilly, lemon sorbet, lemon ice cream, lemon curd and segments of grapefruit, orange and lemon, before it's served with a chopstick-sized sablé biscuit to help cut through the tang.110RMB. Insanely thick and disgustingly rich (in the best way), this milkshake packs in over-generous servings of peanut butter, chunks of brownie and house-made chocolate ice cream. 55RMB.